Now is an exciting moment for Australia, after all the low points of the past two years. The Government showed little real interest in responsible economic management, and it seemed there was little understanding of the damage caused by the various three-word slogans and the Treasurer's weakness. Business confidence and economic prospects suffered from policy confusion and lack of resolution. The effects of the end of the mining boom were exacerbated by the crippling of the comparatively healthy Australian car industry, which took down the South Australian economy as a whole. There were the road blocks put in the way of Australia moving towards a cleaner, safer, renewables-based economy, and a sneaky attempt to give the submarines contract to Japan for dubious foreign policy reasons. Young unemployed were constantly under attack. Economic policy had become destructive, poll-driven, content-free and desperately opportunistic. Australia's sophisticated business community was rightly appalled and angry. Economic confidence sagged. Something had to be done, and on Monday it was. I was surprised at the lightning speed with which things came together. The new PM's timing and tactics were impeccable. He waited, keeping schtumm, until it became clear over the weekend that this tide had to be taken at the flood, or he might miss it altogether. He would have been mindful of Costello's fatal lack of nerve to challenge Howard in time. And yet it was such a close thing in the end, just five unreliable votes took him over the line. The vote showed just how far the Liberal Party has forsaken true liberalism. Ignorant Tea Party attitudes and prejudices now seem rampant. What is in store now for Australia under this new Prime Minister? We can look forward to a real return to greater civil discourse and intellectual integrity in politics. Australians of all parties will welcome this. I expect people like Bill Shorten, Tanya Plibersek, Tony Burke, to play their part as exemplars in restoring a decent political culture. It will be good if they can set aside the negative energy that was brought to the Parliament. They are naturally polite and better than this. Politics, I hope, will return to an informed contest of ideas. There is much to debate. In his acceptance speech, Turnbull emphasised his hopes for better, more reasoned economic policy discussion. This makes sense. The only way he can deal with his right wing is by getting economic runs on the board, and quickly. Improving business confidence and raising the Coalition's low polls will go together, though it means Labor polling must sag in the short run. If he can quickly reassure the Australian business community of better times ahead, business confidence and employment will begin to recover. As Keynes knew, it is all about animal spirits. He was notably silent on climate change, national security and foreign policy. Yet, coming from the sophisticated Sydney electorate of Wentworth, he understands how badly community harmony in a multicultural, environmentally responsible Australia has been wounded over the past two years. He will work quietly, over time, to step back from these ill-judged policy disasters. But he will first have to focus on getting economic confidence right, and he will not be quick to goad his right wing in these policy areas. Labor will press hard on them, as it should. Things like labour market employment safeguards under ChAFTA need a strong Labour voice now. We cannot allow closed foreign enclave investment economies to develop here while young Australians go without jobs. Labor needs to cleanse itself of Blairite globalisers and US camp followers. It needs to reflect on the significance of the popularity of Nicola Sturgeon in Scotland and Jeremy Corbyn in the UK. Labor cannot let itself become a party of cynical compradors clinging comfortably to Chinese or American coat-tails: it needs to restore its faith in its own social ideals and its sense of robust Australian nationhood, based on social democracy and a fair go for all Australians. We can now expect Andrew Hastie to be elected comfortably in Canning, and the new Turnbull Government to run to full term. Let's hope for a civilised but real contest of Australian visions and values in the 2016 election. Labor also needs to move back to its core principals & move beyond costly bipartisan polices that demonise and excludes asylum seekers and First Nations Peoples (FNP). Such polices like "stop the Boats" and the "NT Intervention" and its continuing more nasty 10 year extension "Stronger Futures" (SF) is racist & causing greater disempowerment & destroying lives. The policies cost millions annually and must be revisited urgently. Move to more humane, cost effective and evidenced-based policies that include FNP from the outset of policy formation, and human rights principals that will promote flourishing societies for all; including those seeking asylum from war-torn countries. Polices as mentioned have cost Australian taxpayers billions, is money misspent & costing Australia a lot more. These polices set up failed societies, promote fear and hatred & despair & more E.g. The NT Intervention/SF ,as Close the Gap demonstrates, is failing. In addition, NOT mentioned in these statistics is the skyrocketing Indigenous Incarceration rates, near our world’s worst! FNP represent 3 % of the population but 28% of the prison population. A reflection of costly, racist & socially unjust polices. It also costs in other ways; skyrocketing depression, mental illness,suicides, premature death, lateral & domestic violence and our International reputation. This is a tragedy. 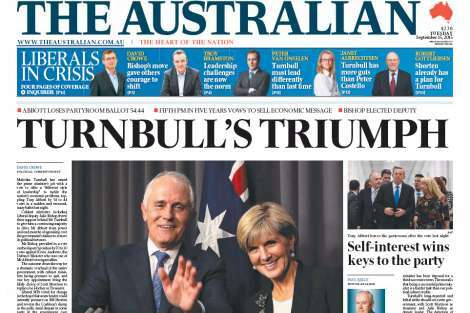 Abbott was voted in by a majority of Australians only to be undermined by the underhanded Turnbull. This is an unfortunate fact for all you Tony - haters. The only thing 'liberal' about Tony Abbott's Liberal Party of Australia was its attitude to the truth. It is a refreshing development since Malcolm Turnbull became PM that most Liberal ministers and spokespeople now appear not only able to engage journalists and common people in intelligent discussion about issues.They are actually willing to do so, and not just speak in 3-slogan phrases, repeated endlessly. But the troglodytes like Dutton are still there, and there is a strange and very loud group of commentators to social media and news sites who seemed to like being treated like a mushroom in the dark. Perhaps the Liberals will learn in the next election just how sick most Australians are of their far right experiment. Hopefully, it is the Tea Party Push who will be purged, not the Liberals who have both brain and social conscience.